There’s a new sheriff in town in central and southern Marjah. 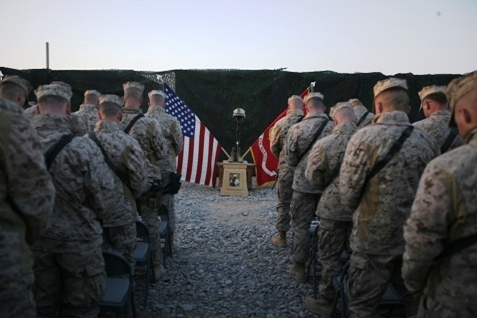 Third Battalion, 9th Marines, out of Camp Lejeune, N.C., has taken over in the former Taliban stronghold in central Helmand province, Marine officials said. The unit replaced 2nd Battalion, 6th Marines, which began cycling out of the war zone late last month. For 2/6, it was a tough deployment. The battalion lost 17 men in seven months, arriving in Helmand in June, during the heart of its fighting season. Things calmed down considerably during the latter half of its deployment, and Marine commanders now identify their area of operations as a success story. The battalion gathered on Dec. 28 at Camp Dwyer, home to the headquarters of Regimental Combat Team 1, which oversees Marjah operations. They have since begun to redeploy home. welcome home 2/6! be safe 3/9! My son Josh is with the 3/9 be safe son I love you. Welcome back 2/6. God please keep these Marines safe.